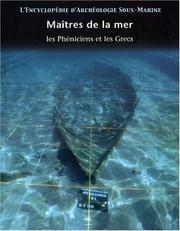 1 edition of L'Encyclopedie D'archeologie Sous-marine (L'Encyclopedie D'A... found in the catalog. Are you sure you want to remove L'Encyclopedie D'archeologie Sous-marine (L'Encyclopedie D'Archaeologie Sous-Marine) from your list? Published April 1, 2003 by Periplus Publishing London Ltd .